The Patriots defense took another hit as they will be without one of their top defensive players and a starter on the defensive line for possibly four games. ESPN’s Adam Schefter has reported that defensive tackle Alan Branch has been suspended four games for violating the NFL’s drug policy. Apparently, Branch tested positive for marijuana. Branch is appealing per Schefter’s report. Branch has been playing some of his best football since becoming a member of the Patriots in 2014. He’s been a valued anchor on the defensive line with Malcom Brown on the interior. This leaves the Patriots thin at the position with just Brown, and rookies Vincent Valentine and Woodrow Hamilton, both of whom have missed time this season due to injuries. So what is in store for the Patriots who have upcoming games against the Jets, Rams, Ravens, and Broncos during Branch’s league imposed vacation? The good news in the short term is that his appeal won’t be heard until next week, so he’ll be able to play against the Jets. 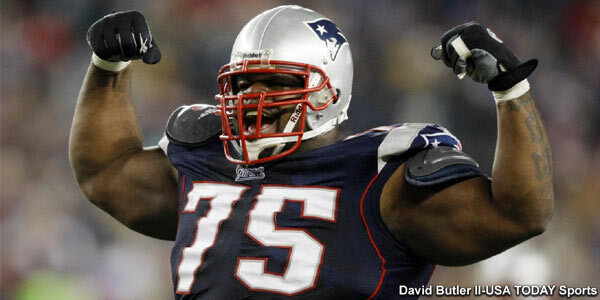 But until Branch is eligible to return expect the Patriots to add another big body to the inside. Who is available? Scouring the free agent market, there are a few names that could be of interest to the Patriots. Former Dolphin and Cleveland Brown Randy Starks, Ishmaa’ily Kitchen who spent some time with the Patriots, Kenrick Ellis as well as two players who spent training camp with the team, Terrance Knighton and Markus Kuhn. With the Patriots defense struggling in recent weeks and facing teams that like to run the football, this could be a costly suspension. The rookies will be looked at to step up in the interim and play some valuable snaps. 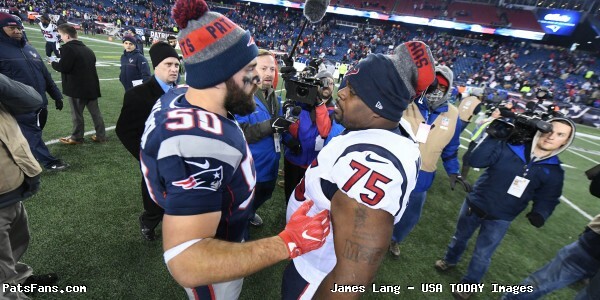 This entry was posted in Patriots Commentary, Patriots News and tagged 2016 NFL Season, 2016 Patriots season, Alan Branch, Baltimore Ravens, Bill Belichick, Buffalo Bills, Denver Broncos, LA Rams, Malcom Brown, Markus Kuhn, New England Patriots, New York Jets, NFL, Patriots, Patriots defensive tackles, Terrance Knighton, Vincent Valentine, Woodrow Hamilton on November 21, 2016 by Steve Balestrieri. The Patriots are rapidly becoming the home of former Cleveland Browns. 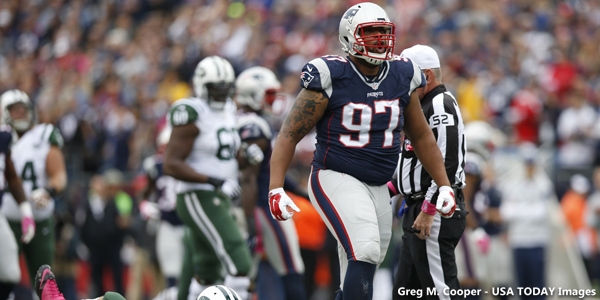 ESPN’s Field Yates has reported that the Patriots are signing former Cleveland defensive tackle John Hughes. Hughes was a 3rd -round 2012 NFL Draft pick out of Cincinnati. He was released by the Browns last week after signing a 4-year, $14.4 million-dollar contract extension just a year ago. He was supposed to be one of the anchors of the Browns defensive line but missed significant time during training camp due to a personal issue. He was used sparingly in the first two games and was shown the gate by Hue Jackson. With the emergence of rookie Carl Nassib, Hughes became expendable for Cleveland. 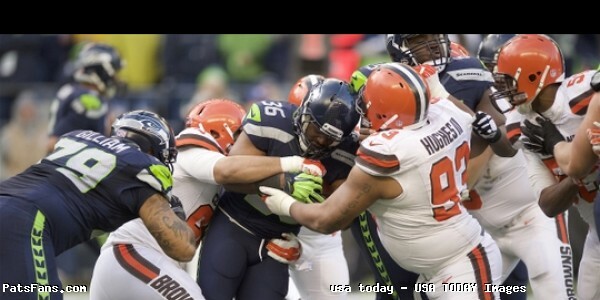 The 6’4, 320-pound Hughes played in 53 games, starting 10 and notched 109 combined tackles to go with 5.5 sacks and a forced fumble in his time for the Browns. With the Patriots releasing undersized DT Anthony Johnson, today, this may be a move considering the Patriots next opponent, the Buffalo Bills who have a potent rushing attack that gained 208 yards against Arizona yesterday. I asked Yates about him minutes ago and he said, that he’s a hard man to miss in person and that he’s a big run stuffing body inside and that he could provide insurance for both Alan Branch and Malcom Brown. Hughes the Patriots roster that includes three other former Browns in linebacker Barkevious Mingo, defensive end Jabaal Sheard and running back Dion Lewis. 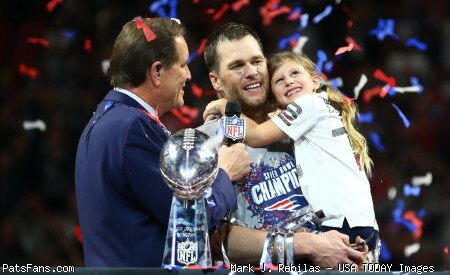 This entry was posted in Patriots Commentary, Patriots News and tagged 2016 NFL Season, 2016 Patriots Roster, 2016 Patriots season, 53 Man Roster Projection, Alan Branch, Anthony Johnson, Bill Belichick, Buffalo Bills, Cleveland Browns, John Hughes, Malcom Brown, patriots defensive line, Patriots defensive tackles on September 26, 2016 by Steve Balestrieri. Texas Two-Step? 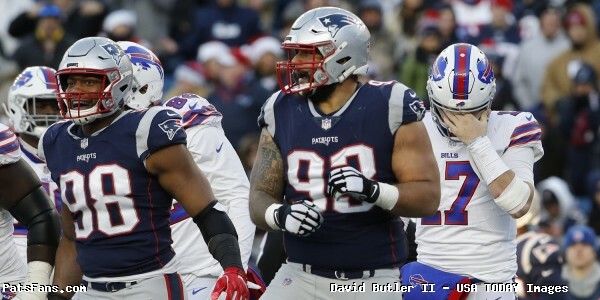 Could the Patriots re-unite Ridgeway with Malcom Brown? The Patriots still have a need at defensive tackle following the loss of Akiem Hicks during free agency. The team signed journeyman Frank Kearse but could use another big body inside who can help stuff the run and push the pocket from the interior. The team used a nice rotation last year of rookie Malcom Brown, Alan Branch, Hicks and Dominique Easley during 2015. With Easley’s injury concerns still an issue, more depth is needed. Branch and Brown may prove to be the top two players but keeping fresh legs and bodies is imperative for the big men inside. The Patriots kicked the tires on free agent Nick Fairley of the Lions and Rams but were thought to be out of the loop now for a deal. While there are still other free agents still available and still a possibility, the draft is chock full of prospects right thru the middle rounds of players who can step up and play immediately. Hassan Ridgeway from Texas is a player who immediately comes to mind and could become a Patriots draft target. 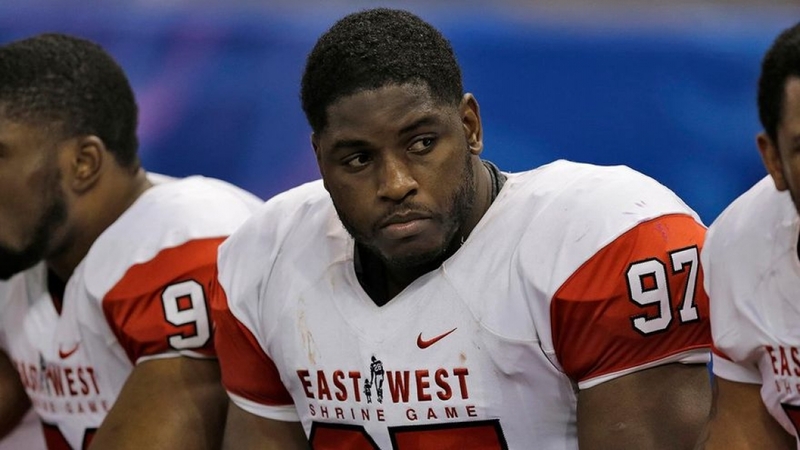 One of the more underrated defensive tackle prospects, he was brought to the Longhorns as a 250-pound edge rusher. He put on 50 pounds and is now an interior presence. Powerfully built at 6’3, 307 pounds, he’s an interior disruptor who can stuff plays in the backfield and push the pocket from the inside. When teamed with the Pats Brown during his sophomore season, he was immense, stuffing 11 plays for a loss. 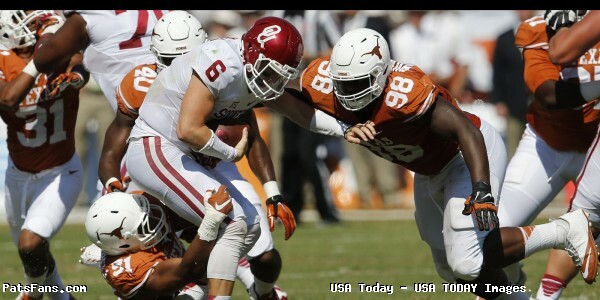 In his final season at Texas, he was again a factor notching 36 tackles, 3.5 sacks and 6.5 tackles for a loss. Ridgeway played mostly five-technique in Charlie Strong’s 3-4 defense but switched to a one-technique when the Longhorns went to a four-man front. 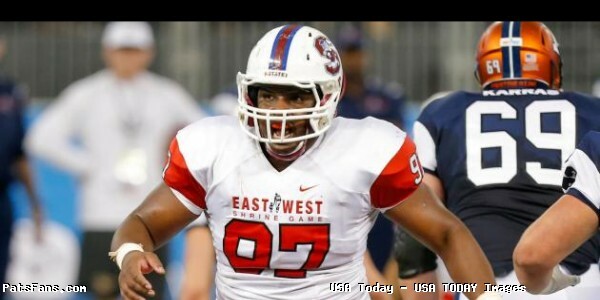 He decided to forego his senior season and enter the NFL Draft a year early. So for the second season in a row, Texas loses its top defensive lineman to the NFL Draft. The last one ended up in New England. Where will Ridgeway end up? Ridgeway turned heads at his Pro Day by running the 20-yard short-shuttle in 4.69 seconds and the 3-Cone Drill in 7.33 which for a big man of his size is pretty impressive. At the NFL Combine he ran a 5.02 in the 40-yard dash with a 1.71 time in the 10-yard split. That is outstanding short area burst and quickness something NFL Network’s Mike Mayock was pointing out when evaluating big men. 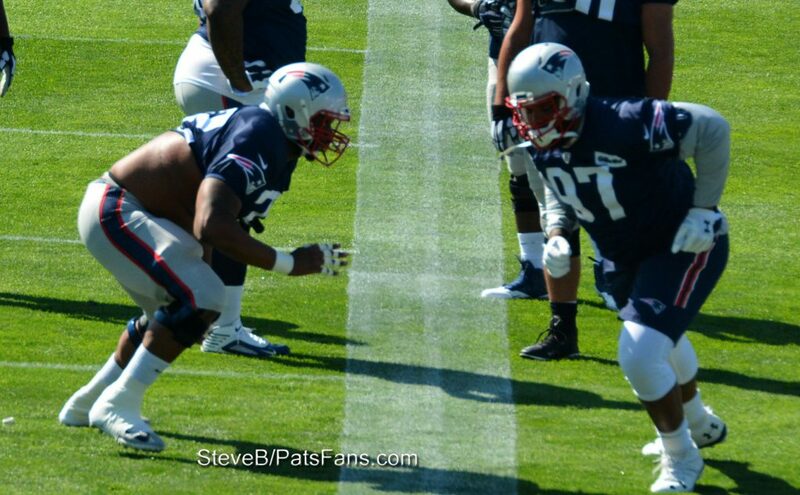 His role is part of the rotation inside for the Patriots defensive line. He’d project initially as an earlier down run stuffing player, but he’s a guy who can shed blockers quickly and get after the quarterback. Ridgeway would fit in very well in the New England system. He’s a powerfully built young man who won’t be easy to move at the point of attack. He has a good football I.Q. and can diagnose plays at the snap, anticipate the design of the play and disrupt. He’s mature and that will play out well with Bill Belichick and the coaching staff. With the Patriots rotating interior men in and out, he’ll benefit playing with veteran Alan Branch and his former Texas teammate Brown. He’s versatile (another Belichick checkmark), and having played both inside and outside on the defensive line will serve him well. As a former edge rusher, he shows good hand work which can still be improved. His pass rushing skills are good, not top notch but can definitely improve with time. There are some conditioning and nagging injury issues but he’d be a very good addition to an already stout defense in 2016. He projects in the Patriots system to be a Potential Starter on Day 1. He should fit in very well into the NE defense as a member of the defensive line rotation. Ridgeway was initially thought to be available around the 4th round of the draft. His impressive Pro Day with Texas may have him moving up draft boards. This entry was posted in Patriots 2016 NFL Draft, Patriots Commentary and tagged 2015 Patriots Training Camp, 2016 NFL Combine, 2016 NFL Draft, 2016 Patriots Draft, 2016 Patriots Roster, 2016 Patriots season, 53 Man Roster Projection, Alan Branch, Bill Belichick, Chris Jones, Dominique Easley, Frank Kearse, Hassan Ridgeway, Malcom Brown, New England Patriots, NFL, Patriots, Patriots defensive tackles on March 26, 2016 by Steve Balestrieri.